As Avid (and an increasing number of more recent browsers) no longer support the outdated Scorch plugin, all newly uploaded scores will now be available to view and listen to on YouTube. Gone are those ghastly midi implementations of the music, replaced by high quality virtual instruments and a video representation of the score. Click here to visit the www.mainly4strings.co.uk YouTube channel. Click on the image below to view and listen to our most recent score on YouTube. 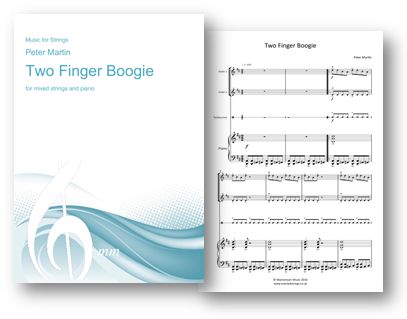 A deceptively simple boogie woogie for young string players, using just first and third fingers with a few open strings thrown in for good measure. The PDF also contains melody and open string parts for viola and cello. Ideal repertoire for that last minute performance.